Establishing a company in Ireland remains a popular choice for investors looking to access the European market. With the low corporate tax rate of 12.5% (among the lowest in Europe) and favourable tax system, Ireland is a highly sought-after location. The economy has stabilised since the recession of 2008 and continues to show strong growth in recent years. The IDA has just released a detailed update of where Ireland ranks when compared to the rest of the world from an economic and competitiveness point of view. This update covers up to Q1 of 2019 and sees Ireland still ranking amongst the top countries in the world to conduct business. The figures produced by the IDA are taken from a broad range of sections throughout 2018 and into 2019. Notably, GDP growth for the first three quarters of 2018 is 7.4% second only to Malta in the Eurozone. Year on year Ireland’s GDP growth of 4.9% makes for strong reading when stacked against the Eurozone average of 1.6%. This is due largely to the continued expansion of Foreign Direct Investment (FDI) with many multinationals establishing companies in Ireland. There are now 229,057 people directly employed by FDI companies bringing in additional financial benefits from of those businesses investing here. These multinational companies account for billions of euro contributed to the Irish Economy, with €19.2bn spent on payroll and material, €5.7bn of capital expenditure and just under €2bn of investment into in-house research & development. Much of the recent growth of the Irish economy can be attributed to the country’s favourable business environment and tax system including its continued commitment to the low 12.5% corporate tax rate. Large multinationals like Apple, Google and Facebook have all placed their European headquarters in Ireland due to its highly skilled workforce and tax system. The corporate tax rate of 12.5% on trading profits remains one of the lowest in Europe. Politicians in Ireland have consistently supported this attractive rate and have made a long-term commitment to maintaining this level going forward. This, in turn, has led to continued growth in the labour market resulting in 9 of every 10 jobs lost in the recent recession being replaced. As of Q4 of 2018, unemployment is at its lowest level in 10 years at just 5.7% standing below both the EU and Eurozone averages. There are many benefits living, working or establishing a company in Ireland, which has also ranked 1st for flexibility and adaptability of its workforce. Ireland also has the youngest population in the EU and the lowest share of over 65-year olds, which will drive the country’s continued future growth. With Brexit looming, Ireland will stand as the only English-speaking location within the Eurozone. 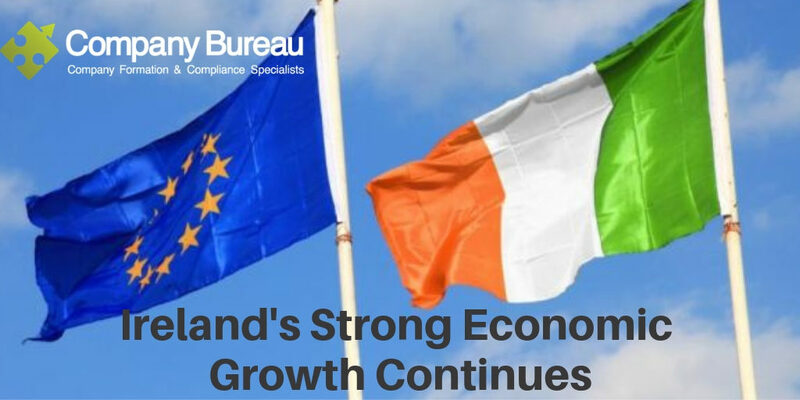 The above year on year GDP growth in all aspects of the economy serves to exemplify how strong Ireland has performed in recent years, this growth is expected to continue throughout 2019 and beyond. Should you wish to discuss the benefits and rationale for establishing a company in Ireland further please don’t hesitate to contact our Formations Manager, Gary Harpur at gary@companybureau.ie or call the office on +353 (0)1 6461625.